Antonio Conte says he is giving "all of himself" to Chelsea and has asked the club to reciprocate with a public vote of confidence. 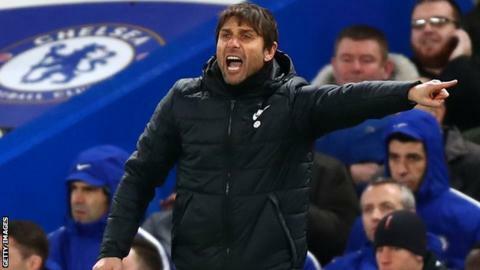 The Blues boss won the Premier League title in his first season in charge at Chelsea but has come under scrutiny this season amid his side's poor form. Conte has 18 months remaining on his contract at Stamford Bridge. "I'd like to have a statement to support against this speculation," said the 48-year-old Italian. "Maybe I'd like that the club prepare a statement to tell the media, 'I trust in his job, I trust in his work'." Chelsea travel to Watford on Monday, 19 points adrift of Premier League leaders Manchester City following their 3-0 defeat to Bournemouth on Wednesday. They face a fight to secure a top-four finish while their only hope of silverware this season is in the Champions League and FA Cup. But despite the rumours surrounding his future at the club, Conte says he is open to contract extension talks. "I'm giving all of myself for this club," he said. "I think that we are doing the maximum for this club and if the club understands this and the club wants to extend a new contract then we can talk, why not?"